An exchange of sound between Stratosphere (aka Ronald Mariën, Dirk Serries’ longtime soundtechnician) and Dirk Serries (VidnaObmana, FearFallsBurning, Microphonics, 3 Seconds Of Air, The Sleep Of Reason, Continuum). Drawing from genres like post-rock, shoegaze ambient, and drone music, In A Place Of Mutual Understanding beautifully blends all these style into a collection that is atmospheric, harmonic, dynamic and even dramatic. Created with electric guitars and basses – and featuring an ethereal guest vocal appearance by Martina Verhoeven – these pieces build waves of guitar patterns and textural washes, heavy stabs, and peeling figures into a stirring moodscape that’s as uplifting as it is beautiful. 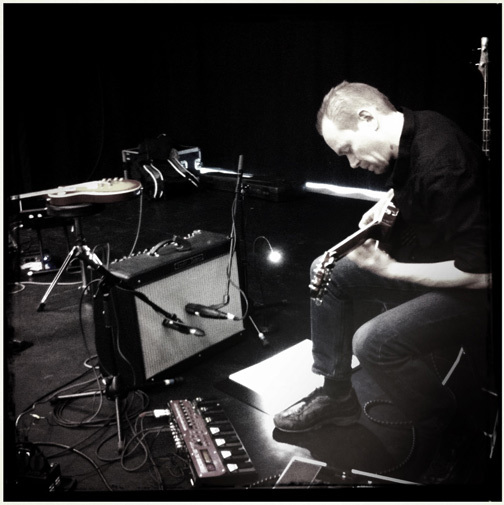 In the early 90’s Ronald Mariën solo-project, Stratosphere, began experimenting with music. Using analog tape devices combined with synth sounds, the first songs were created. After these first steps, audio recordings were added that complemented and defined the typical Stratosphere feel. Spheric soundcapes with harmonic melodies became the signature sound of Stratosphere. This resulted in a few releases in the next years together with some live performances. Feeding on these experiences, more acoustic instruments (including guitar) were added which created an even more harmonic sound. After a decade of silence, and a dramatic change in life, Stratosphere picked up music again in 2009. Using his experience as a sound and recording engineer, his interest in music creation returned. This time, only guitar and bass guitar were used, in combination with a wide range of pedal effects. Simplifying his working method, resulted in an number of new tracks. Due to the changes in life, a darker side is introduced, but the typical sound remains. Soundscapes and harmonics are still the base of his music. So a new era has started for Stratosphere returning to the music scene with a fresh view and renewed motivation. After his 1986 3″CD ep The Introspective Spaces on the Italian Amplexus label, Stratosphere returned in 2012 with his first full-length album Dreamscape on the French Label, Basses Frequences. 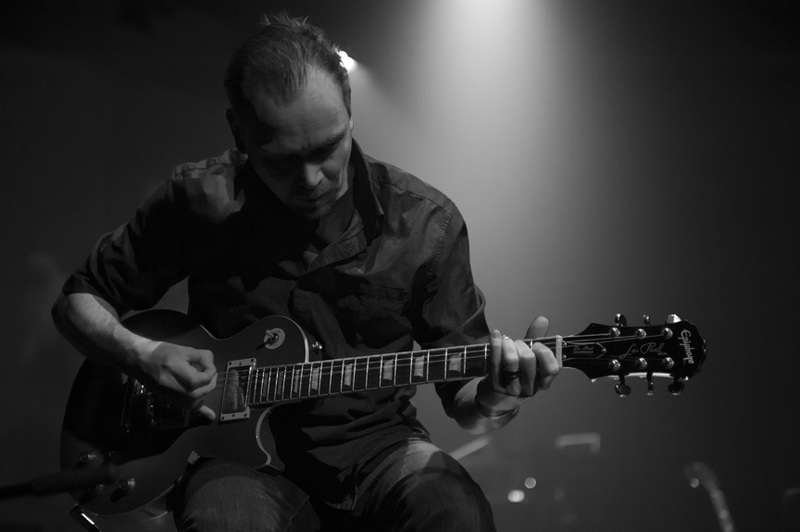 Since his first releases in the early 80s, uncompromising Belgian artist Dirk Serries has garnered respect from and invitations to collaborate with recognised musicians like Steven Wilson, Steve Von Till, Justin Broadrick, Cult Of Luna and Alan Sparhawk of Low. He has been commisioned to write works for Dutch national television broadcaster VPRO, the Antwerp Zoo as well as architectural festival Biënnale Rotterdam and worked on stage with the Holland Symfonia orchestra. His discography encompasses stylistically diverse releases on labels like Relapse, Projekt, Conspiracy as well as his current creative partner Tonefloat (a label with years of experience in vinyl editions for acts like Porcupine Tree, Robert Fripp, Theo Travis and Anja Garbarek.) Over the past thirty years, he has toured extensively through Europe and the USA and performed at some of experimental music’s major venues and concert spaces. Da quando Dirk Serries ha abbandonato il progetto vidnaObmana, dopo i quattro capolavori della saga “An Opera For Four Fusion Works”, la sua chimica sonora si è mossa verso una direzione completamente nuova. Messe da parte anche le ultime avvisaglie di quel pastiche cosmo-esoterico che aveva fatto la fortuna del suo ventennale moniker, nelle incarnazioni di Fear Falls Burning e nei seminali “Microphonics” (pubblicati a nome di battesimo) Serries ha imboccato una strada totalmente inedita. Accantonati tastiere e synth e imbracciati chitarra elettrica e una miriade di pedali ed effetti, le sue escursioni si sono mosse verso il territorio drone più classico e legato alla tradizione minimalista. Dietro quelle lunghe odissee composte da flussi monocromatici scomposti e ricomposti in varie combinazioni e sfumature, un ruolo fondamentale – a detta dello stesso artista belga – lo ha giocato Ronald Mariën, ingegnere del suono che lo affianca ormai dal 2006. L’incontro fra i due risale in realtà al lontano 1992, anno in cui proprio la sponsorizzazione dell’allora vidnaObmana permise al meno noto connazionale di avviare, con una deliziosa quanto introvabile audiocassetta (“Lost In Unity”), la sua carriera da musicista a nome Stratosphere. Ci sarebbero poi voluti vent’anni perché qualcuno (nello specifico Bass Frequences) permettesse a Mariën di produrre un lavoro su larga scala, materializzatosi l’anno scorso nell’altrettanto splendido “Dreamscape”. Una consacrazione (forse volutamente) tardiva, del cui cerchio le quattro fotografie di “In A Place Of Mutual Understanding” si pongono come autentica e definitiva chiusura. Serries torna vent’anni dopo a metterci lo zampino – stavolta sotto forma di collaborazione artistica e di un posticino fondamentale sul catalogo Projekt – e Mariën dal canto suo mostra a tutti sul pratico la caratura del suo apporto al soundworld del maestro e connazionale. Il tutto in un disco che sfiora l’eccellenza con un dito, tornando a far luce una volta ancora sulle potenzialità evocative di una miscela che nell’introduzione di “Unfold The Obscurity” rischia di portare qualsiasi amatore alla commozione pura, aprendosi con inattesa naturalezza a un candore astrale. Were a listener presented with In a Place of Mutual Understanding without being told the artist responsible for it, there’s a strong chance said listener would identify it as a release by Dirk Serries, whether issued under his real name or an alias such as FearFallsBurning or Tonefloat: Ikon. In fact, the forty-three-minute release does involve Serries, though it’s formally credited to Stratosphere with Dirk Serries. 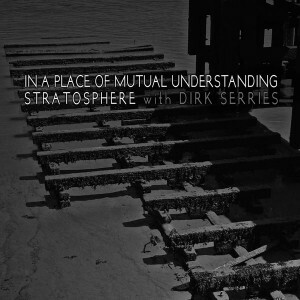 That the two share a special bond is borne out by the fact that Ronald Mariën (aka Stratosphere) is Serries’ long-time sound technician, so it makes some kind of natural sense that the album, Mariën’s follow-up to his 2012 Stratosphere album Dreamscape on Basses Frequences, sounds as it does and hews closely to the style associated with the Tonefloat imprint. Created using guitar, bass guitar, and pedal effects, Mariën’s harmonious Stratosphere soundscapes are stylistically close in spirit to Serries’ own. Details of authorship aside, the album presents four settings, three in the seven-minute range and one almost twenty minutes in length. While the content as a whole is excellent, it’s the longest one, “Dawn Will Reveal Itself,” a textbook example of guitar-generated soundsculpting, that’s especially memorable. In this tour de force, Mariën and Serries slowly layer shimmering guitar- and bass-generated tones and washes until they become a towering yet peaceful and even uplifting choir. Elsewhere, “Distance” affectingly plumbs the depths of sadness, while “Confront the Reflection, Then Shatter the Mirror!” assumes an even stronger epic quality when Martina Verhoeven adds ethereal vocalizing to the droning stormcloud. Admittedly, it’s not the first time we’ve heard such material, but In a Place of Mutual Understanding nevertheless presents exceptionally beautiful examples of sustained moodscaping. Modern technology applied on string instruments (electric and acoustic guitars, bass, fretless bass, etc.) has provided the guitarist for new ways to set sounds, even though many experts say that it has slowed the pace; in the last years we have seen an increasingly widespread use of foot pedals that are able to deform the sounds beyond imagination, an improvement of the amplification and an enhancement of digital technology which is offering new ideas for work, in particular the digitization and software that processes sounds (we intend all those processes that connect the stringed instrument with the computer) are very well-liked by guitarists seeking an “overexposure” of sound. In fact, we speak of something that is very close to the sensitivity of ambient and new age musicians who have begun to experiment in this direction some time ago. The Belgian Dirk Serries, known figure of ambient music for many important collaborations and for his eclectic musical setting, is one of the musicians who is engaged in this path seriously. In recent years Serries seems to be totally interested in this type of experiment that carried out in the guise of Microphonics: now he continues to experiment in the Stratosphere’s project led by Ronald Marien, a musician (even sound engineer) who develops the same experiments of Dirk. In a place of mutual understanding follows the plots of live performances by the Belgian artist (see something here): the two musicians use keyways resting on the chord where the sound is processed by the computer and they exploit erratic wastes of the distorted amplification: with few resources they transport us into immeasurable and powerful musical spaces; if the musical matrix is represented by Brian Eno style of the period of U2’s production (the one where delays and distortions have created a style-sound), we can say, however, that Marien and Serries build their personal textures, sometimes obscure, made ​​of drones in slow dynamics of change, a clear and deep immersion in the resonance of the strings taken to the highest levels of emergence. A beneficial listening experience. Nonostante sembra che abbia rallentato il ritmo, la tecnologia moderna sulle chitarre e simili (acustiche, bassi, etc.) ha fornito al chitarrista nuovi modi per impostare i suoni: negli ultimi anni, oltre ad un uso sempre più capillare di pedaliere in grado di deformare i suoni fino all’inverosimile e ad un miglioramento dell’amplificazione, è la tecnologia digitale che sta offrendo nuovi spunti al chitarrista; in particolare la digitalizzazione e i software che processano (intendendo tutti quei processi che collegano lo strumento a corde con l’informatica musicale) sono molto ben voluti dai chitarristi che cercano nella chitarra una “sovraesposizione” sonora. Si tratta di qualcosa che a ben vedere è molto vicina alla sensibilità dei musicisti ambient e new age che già da tempo hanno cominciato a sperimentare in tal senso. Uno di quelli che lo sta facendo nel migliore dei modi è il belga Dirk Serries, nota figura del settore per le tanti importanti collaborazioni e per una propria eclettica impostazione musicale. Serries in questi ultimi anni sembra essere totalmente interessato a questo tipo di esperimento che ha svolto sotto le spoglie di Microphonics e che sta continuando nel progetto di Stratosphere condotto da Ronald Marien, un musicista (anche tecnico del suono) che sta conducendo gli stessi esperimenti di Dirk; In a mutual place of understanding segue un pò il canovaccio delle esibizioni live dell’artista belga (vedi qualcosa qui) dove con l’aiuto di un chiavetta appoggiata sulla corda in cui il suono è processato dal computer, e sfruttando gli scarti erratici di un’amplificazione distorta, siete trasportati in incommensurabili e potenti spazi musicali: partendo stilisticamente dal Brian Eno del periodo di produzione degli U2 (quello in cui i ritardi e le distorsioni hanno creato uno style-sound), Marien e Serries costruiscono le loro tessiture, un pò oscure, fatte di droni in lenta dinamica di variazione, un’immersione chiara e profonda nella risonanza delle corde portata ai massimi livelli di emersione. Una benefica esperienza d’ascolto. A review from Santa Sangre Magazine Poland. 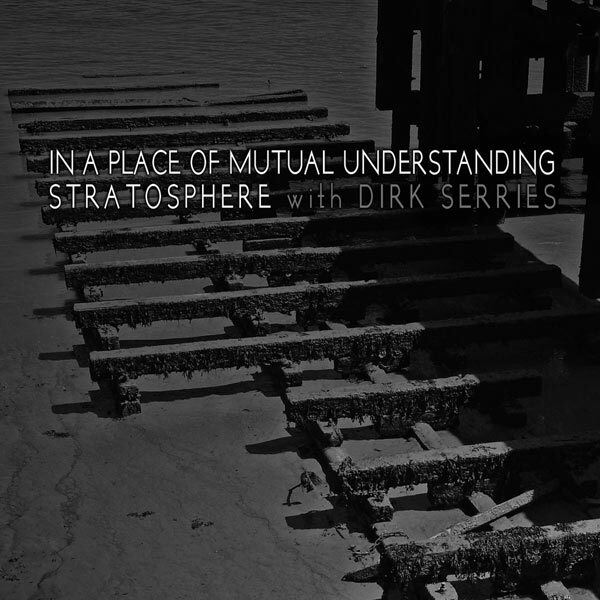 In A Place Of Mutual Understanding is a collaboration between Belgian artist Dirk Serries, well known for his work in numerous projects such as vidnaObmana, Fear Falls Burning and Continuum among others, and Ronald Mariën, who apart from releasing his own material under the Stratosphere moniker (his latest release was “Dreamscape” in 2012) has worked as Serries’ sound technician for a long time. The two musicians collaborate here for the first time, in this 4-track release the title of which implies the artistic common space the two share, where they have entered to create this very special music. The album’s main core is comprised of electric guitar and bass drones, on the foundation of which is built an ethereal, trippy atmosphere that, although not standing firmly upon that particular pedestal, borrows heavily from post-rock and shoegaze. In addition, the strong connection between the tracks – the record can easily be perceived as one long track – and the esoteric, composed and balanced nature of the music, taking care to not get completely carried away by the emotions it expresses, bring the experience closer to ambient than post-rock. A few minutes into the recording however, it is clear that it defies genre classification. The complex layering and expertly woven, tight web of drones creates the impression of a voluminous mass, and when combined with the delicate play of tone and texture, only the minimal amount of melody is needed to affect the listener. The first track, “Unfold The Obscurity”, perhaps the most complex and most dramatic of the album, is comprised of slow-moving, melodic drones interweaving with one another, increasing and decreasing, lifting their head above the surface for a while, only to sink back into the void a few moments later. The title implies the sympathetic approach of the music towards said obscurity – the patient breaking of its hard, cryptic shell, to unveil the strange beauty lying within. The second track, “Dawn Will Reveal Itself”, is much more minimalistic and has a darker, more downcast feel to it. Unfolding on an even pace it brings us back to earth, allowing the emotions to cool down. The tension is considerably loosened, barely maintained by the contradiction between ringing, high-pitched drones and low-frequency bass drones. The central feeling here is that of letting go. In “Distance” we are further initiated into the darker aspect of the album, as the sadness lurking in the background is made more evident. An unseen tragedy is hidden beneath the high-pitched, melodic crescendo that is the main element in this track. Just as we are about to surrender to this hopeless despair, “Confront The Reflection, Then Shatter The Mirror!” offers some sort of way out. Its ethereal female vocals and lighthearted atmosphere take us back to the peculiar cheerfulness of the first track, after being plunged into the depths of the album’s melancholy core of inspiration. Here the guitars are crunchier and the sound is a bit ‘dirty’, fading away from ambient and into post-rock territory, allowing for a fair amount of optimism and self-consciousness. Accumulating on guitar drones as its duration increases, the track ends with a liberating, noisy escalation. Despite its relatively short run time (the release is 43 minutes, ed.) this release manages to imprint on the listener immediately, playing on the best elements of many different genres that however all have something in common; they share an affinity towards the creation of dreamy, esoteric atmospheres able to evoke emotions, often coded underneath powerful imagery. The two musicians work together in perfect harmony for the creation of just such atmospheres, and in this case it’s absolutely fitting to use the saying a little differently: “Jack of all trades and master of all”. A beautiful recording that will leave you wishing for more when it’s finished. Stratosphere is Ronald Mariën, who is Dirk Serries’ sound technician, but who has several previous solo releases dating from the 1990s. Dirk Serries himself should need no introduction, although he really does. Until recently, he has maintained relative anonymity hiding behind various alter-egos: from the mid-1980s until around 2005 he was VidnaObmana, with many releases and collaborations to his credit; then with a stylistic change toward the post-rock idiom he became Fear Falls Burning. In more recent years he has used the moniker Microphonics and others, but for the last few years he’s just using his real name as he continues his musical explorations. And so it is with the collaboration at hand. A limited pressing of 200 CDs, we have two explorers pooling and blending their styles into four lengthy tracks, informed by floating ambient, passive industrial, shoegaze, and dronescapes. The result is dreamy and amorphous, without rhythm per se, but heavily textured and approaching metallic at times, but nothing grinding and painful; and there are no vocals to get in the way of these purely expressive sound sculptures. A lot of this reminds of artists like Lustmord, Lycia, Matthias Grassow, or any of a number of artists on the Relapse label, or for that matter even Fripp and Eno’s Evening Star. The whole album is only around 44 minutes; I sort of wish it was longer, and the silence after the last track is unbearable, so I keep playing it over and over again… Truly a massage for the brain.